Treatibles has been creating thoughtfully formulated pet products with superior quality ingredients and providing consistency you can trust since 2013. 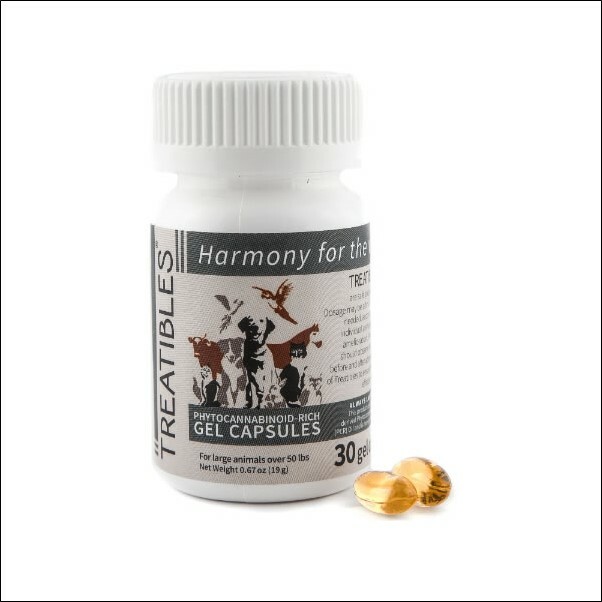 Treatibles Phytocannabinoid-Rich (PCR) Oil Gel Capsules can help provide calm, balance, support and vitality to any size companion. 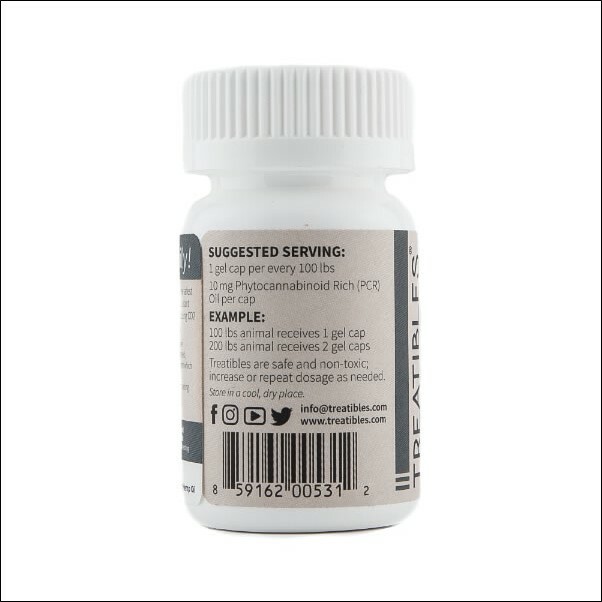 Treatibles does not make any health claims about phytocannabinoids (pCBDs) or any of the ingredients in their products. The results shared by pet owners are anecdotal from more than 2,000 customers. These customers find that Treatibles help pets with a myriad of conditions including anxiety, promoting healthy joints, promoting healthy digestion, seizures, discomfort, pain from everyday activities, loss of appetite, and more. How do phytocannabinoids work in your companion? All animals have an endocannabinoid system that assists in maintaining the physiological, neurological and immunological systems of the body. The endocannabinoid system was first discovered in the 1960s by Israeli scientist Rafael Mechoulam. If there is a deficiency of endocannabinoid production, the system’s multiple receptors will utilize the addition of phytocannabinoids to help create calm and balance and provide support for relaxing, repairing or restoring. Dogs are especially responsive to phytocannabinoids as they have the highest concentration of cannabinoid receptors in their brain and body compared to other animals, including humans. Cannabinoids are a group of chemical compounds present in all animals (except for insects) and in the plant genus cannabis, which includes both hemp and cannabis. When found in plants, these are known as phytocannabinoids (phyto means plant). Hemp based phytocannabinoids offer a wide range of therapeutic applications but without the psychoactive properties of THC, which is found in cannabis and medical cannabis. Hemp contains more than 80 cannabinoids and less than .3% THC. 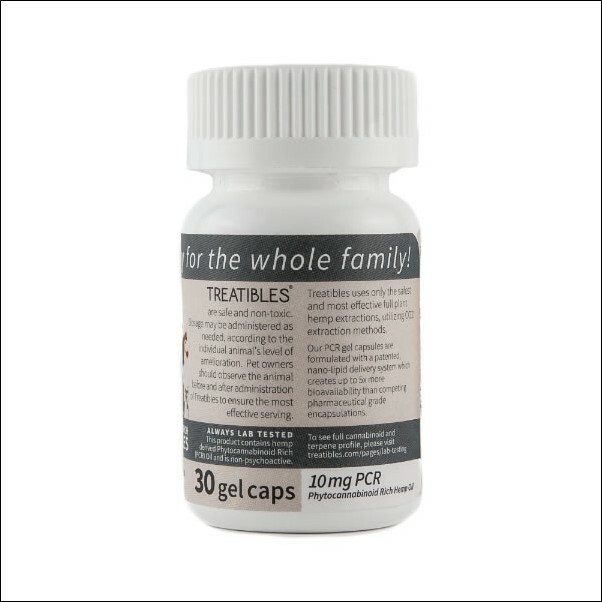 Treatibles offers a line of supplements including grain free hard chews, dropper bottles, and gel caps containing phytocannabinoid rich (PCR) oil extracted from whole plant medicinal grade hemp grown in the USA. In addition to several therapeutic phytocannabinoids, terpenes and flavonoids are included creating what is known as the entourage effect, providing a full spectrum of benefits for pets. Phytocannabinoids are very effective in bringing calm and balance to pets suffering from a myriad of conditions. In addition to promoting healthy joints and digestion, phytocannabinoids are recognized for helping pets with general anxiety, separation anxiety, discomfort, loss of appetite, seizures, end of life comfort, and more. Treatibles was the first company to create phytocannabinoid infused products for pets. Our products are virtually free of THC, the psychoactive cannabinoid found in cannabis. Treatibles are legal to sell and ship to all 50 states. Treatibles sources the best ingredients possible for their Treatibles formulas. All of their ingredients are human-grade. Some are certified organic and, with exception to the turkey, all other chews are vegan. Treatibles products all contain phytocannabinoid rich oil extracted (using CO2 extraction method) from whole plant medicinal grade hemp grown in the USA. Products are third party lab tested at every stage, from the raw materials to the finished product. Treatibles tests to quantify the exact milligrams of phytocannabinoids in every chew, dropper bottle and gel cap. In addition, they test to ensure the products are free of bio-contaminants and heavy metals. Treatibles can begin working in as little as 5 minutes up to one hour. Each capsule contains 10 mg of PCR hemp oil. This size capsule can be used for animals 50 lbs or greater in size. It is ideal for large dogs and other larger animal friends including goats, pigs and more. Follow dosage information below based on your pet's weight. Amounts below are per serving. This capsule can be given 1 capsule/100 lbs or for animals greater than 250 pounds, purchase 25 mg capsule dosage. Repeat every 4-8 hours as needed. Smaller animals may only need a dosage every 12-24 hours. Click the icon to view the serving sizes for each Treatibles product. NOTE: The above is only a guide. Every pet is a unique individual. Some may need more or less. You know your pet better than anyone.